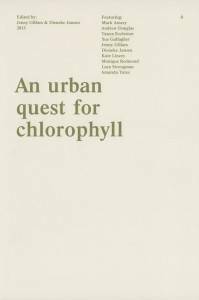 The publication An urban quest for chlorophyll aims to discuss projects that engage with the cultural mediation of nature in an urban context. Architects, designers and town planners all consider the role played by green spaces within the urban terrain, from parks to abstractions such as berms and planters. The design of public urban space always takes this into account. How do these injections of chlorophyll function? If they have no possibility of simulating the rural, why are we compelled to ‘drag the pot-plant into the office’ or more ambitiously grow crops and community gardens in the heart of the city? The increase of urban rooftop gardens, community plots and urban agriculture suggest that becoming green is a high priority for urban planners. with projects such as Live Green, where 30,000 plants were planted in Sydneys’ CBD over the summer 2011, attesting to these growing desires. 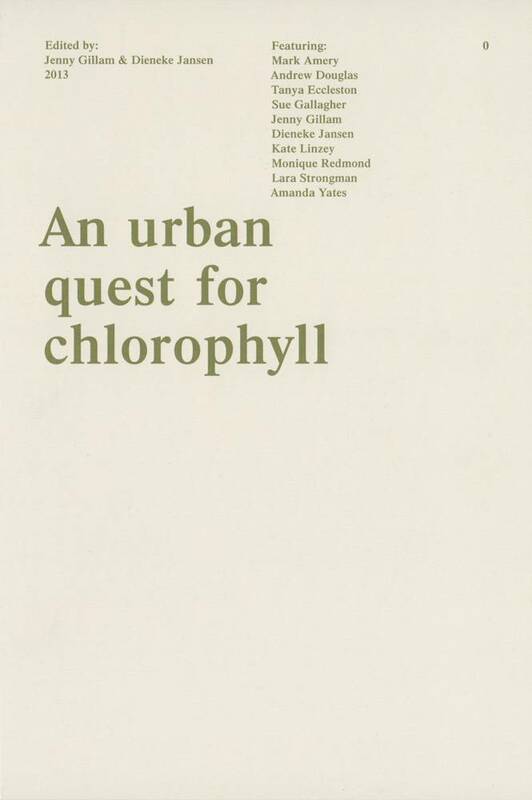 The publication An urban quest for chlorophyll, profiles four recent creative engagements with these ideas, bringing together a range of practices where notions of urban planting are explored in a New Zealand context. Edited by Jenny Gillam & Dieneke Jansen, the book includes projects by Tanya Eccleston and Monique Redmond working as the Suburban Floral Association; Amanda Yates, leader of AUT University’s Emergent Ecologies Lab which focuses on urban design, indigeneity and ecology; Gillam & Jansen, artist/academics who co-authored a public photographic work; as well as texts by Lara Strongman, a writer, curator, and art historian based in Christchurch; Kate Linzey, a Wellington-based academic with an interest in the margins between architecture, art and urbanism; and a conversation between Yates and colleagues Andrew Douglas and Sue Gallagher. Mark Amery, an arts editor, curator, critic, broadcaster and writer with a particular engagement with art in public spaces, provides a foreword.